Dina from Wordfeeder here. I had this idea today. I thought it'd be fun to try making one of those Big Fat Bundles that I've seen other PLR sellers do. The difference, though, is that I really don't have any "old" PLR. So this is an LTO (Limited Time Only) offer. Ends on June 30. The "June Jumble" Summer Savings Blitz from Wordfeeder. 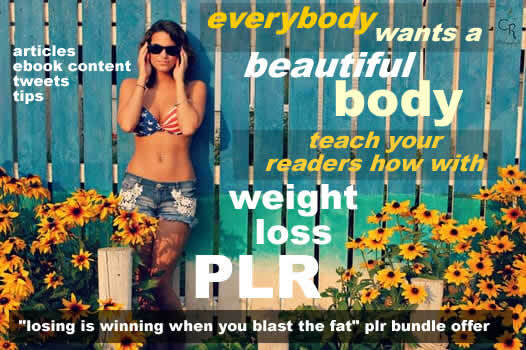 JUST LAUNCHED Weight Loss PLR Bundle: "Losing is Winning When You Blast the Fat"
Hi, this is Dina from Wordfeeder PLR. 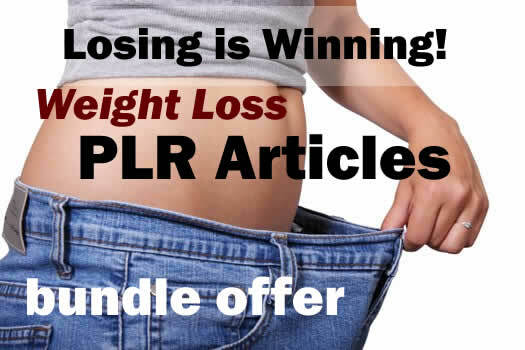 I mentioned recently that my writer friends and I were planning to bundle up our weight loss PLR to offer you some great savings. Well, it's bathing suit season! People are out and about, with their scantily clad bods on show for the world to see. Happy Tuesday, Warriors. What are your plans for the week? This content emphasizes health and wellness. So if that's your readers, then you may want to grab your copy to do a healthy weight loss feature on your site this summer. It's set up to work as an ebook which you can sell or share. Hey, Dina from Wordfeeder here. It's time to start exercising your potential for profit. We have the high quality articles you need to push some fresh weight loss content out in front of this multi-billion dollar audience of eager prospects. This week I ran my first WSO in the weight loss niche and received some great feedback from it. Many people have stated that they will use the report as a freebie for new subscribers to their lists. Others enjoyed the autoresponder messages, as they just don't have time to write them for themselves. All of this information is really helpful to me as a PLR provider. It gives me direction for my content, as my whole aim is to give customers what they need.